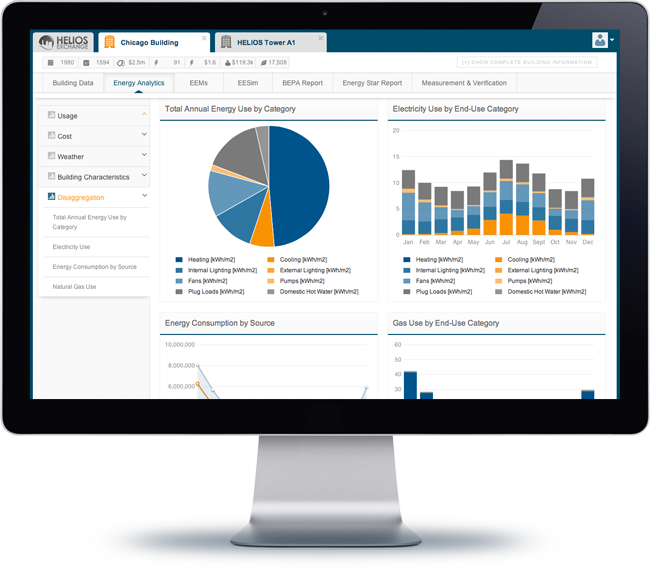 HELiOS EE-SIM™ (Energy Modeling Tools for Retrofit Analysis) allows non-experts to rapidly model their properties and analyze their energy retrofit opportunities. This eliminates the need for costly and labor-intensive energy engineering cycles to develop and identify viable retrofit projects. HELiOS EE-SIM™ is based on a standardized building energy model that has been in use across Europe for evaluating building codes and energy performance for over 10 years. HELiOS uses advanced algorithms to calibrate the model to actual building energy use. The clear advantage is drastically reduced modeling time from 1 to 2 weeks of expert building energy scientist time to less than 1 hour. HELiOS EE-SIM™ has been validated under ANSI/ASHRAE Standard 140-2011, “Standard Method of Test for the Evaluation of Building Energy Analysis Computer Programs”. Click here to download verification report. The US Department of Energy has recently completed favorable comparison studies with DOE2.2 and EnergyPlus, thus validating the use of this simplified building energy model.